Gifts and Taxes: how much does it cost to make someone happy? Mr. Sharma inherited a large sum of money from his grandfather, as per the latter’s will. He then decided to invest the money in a bank fixed deposit after using some of it for some family expenses. His wife, however, expressed her concerns about whether the gift money received would be taxable. She was especially concerned due to the recent demonetisation and increased tax scrutiny of high-value transactions. In fact, the money received as part of the will was becoming a reason to worry for her. 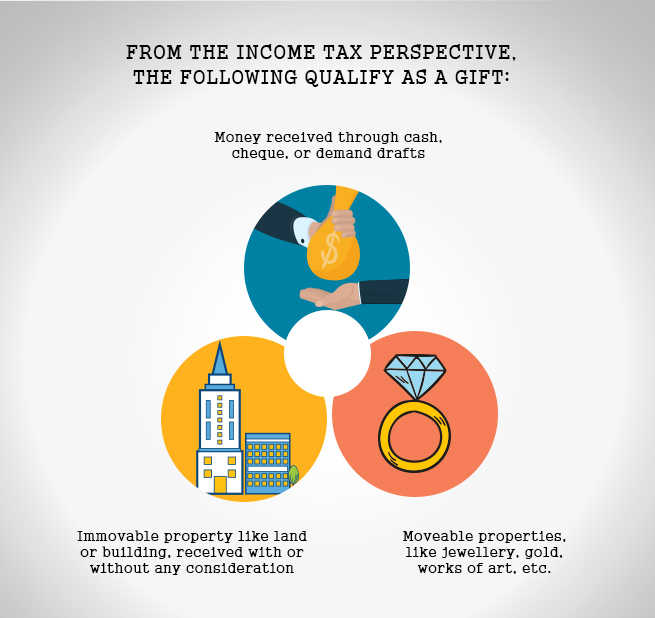 If you’d like to save yourself similar tension, read on to find out the various types of gifts that are taxable in India. Moveable assets such as jewellery, gold, works of art, etc. *Consideration means either a payment of money or any other thing given in exchange for receiving the property. If you receive any of the above-mentioned gifts, you should consider the tax angle. Gifts may be tax-free or taxable, depending on the nature of the gift. A Gift affidavit, though not mandatory, can avoid tax complications. So, any gifts you receive should ideally be supported by an affidavit. Therefore, it is important to understand all the different instances involved. Money received from anyone other than your relatives, for instance, your friends or colleagues, is taxable only if it exceeds Rs 50,000 in a year. Another thing to note here is that in this instance, not just the amount over and above Rs. 50,000 but the entire gift amount is taxable. The tax you stand to pay is based on your income tax slab. However, there is an exception to this rule. Any amount of monetary gift received from relatives as well as non-relatives as a wedding gift, inheritance, or execution of a will is exempt from tax for the recipient. 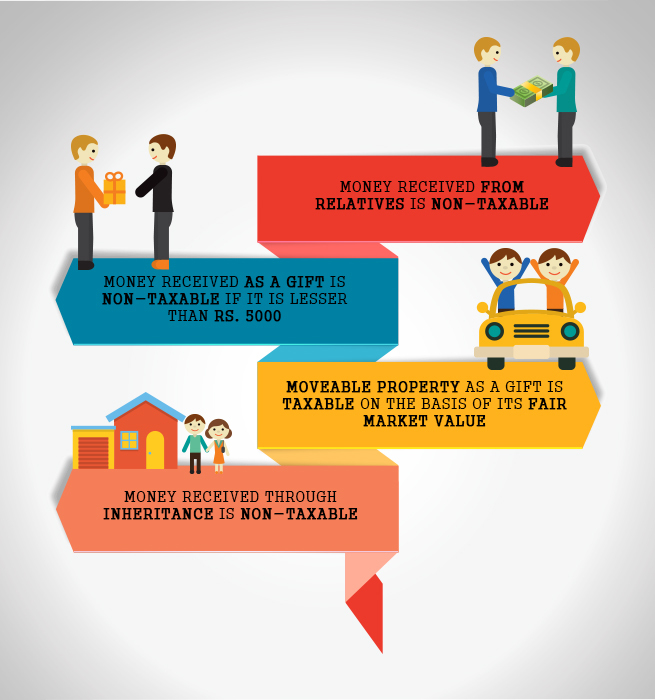 You need not worry about paying tax on monetary gifts when they come from relatives. The entire amount received by you is tax-free irrespective of the amount. A piece of land or house received as a gift from relatives, on occasion of marriage or through a will or inheritance stands to become taxable if the stamp duty is above Rs. 50,000. So, if the stamp duty exceeds an amount of Rs 50,000, then it is included in your taxable income and then taxed as per your Income Tax slab. This would not happen if the amount is less than Rs 50,000. The amount of stamp duty—usually measured as a percentage of the property value—depends on the state the property is in. In case you receive the property for a consideration and the stamp duty is above Rs 50,000, the difference between the stamp duty paid and the value of the consideration is taxable. This difference would be included in ‘income from other sources’ and added to your taxable income. Then it would be taxed at your income tax slab rate. In case you receive moveable assets as a gift from relatives or on the occasion of marriage, or through a will or inheritance, the entire Fair Market Value (FMV) becomes taxable if stands at more than Rs 50,000. Anything that has a lower FMV is exempt from all tax for the recipient. In case the gift received is for a consideration, then the difference between the FMV and the consideration should be above Rs. 50,000 for the gift to become taxable. The difference would be included under the head ‘income from other sources’, clubbed with your taxable income, and then taxed at your income tax slab rate. Related: How to keep your family informed about your financial details? Does the giver enjoy any tax benefits? As per Indian regulations, taxes on gifts are to be borne by the participants in certain scenarios but never really by the giver or donor. While they don’t have to pay any taxes, givers aren’t entitled to any tax exemptions on gifts. The moment Mr. Sharma educated his wife about the taxation laws surrounding gifts, her concern turned to delight. She was as excited as him about the inheritance money received and the forthcoming Europe trip her husband had planned with that money. 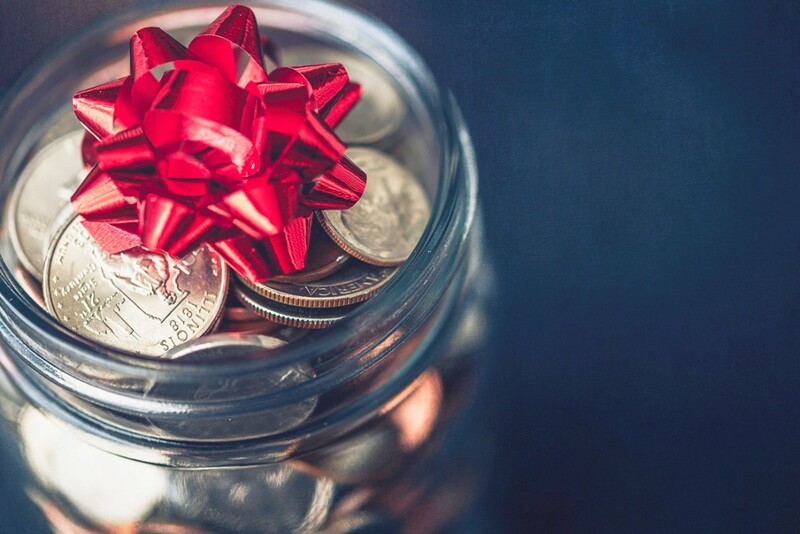 When it comes to giving and receiving gifts that are high in value, make sure you have brushed up on your knowledge about its tax implications. It will go a long way in helping you have a clear picture about whether you need to set aside some money towards tax when receiving a gift.